We are currently on vacation in Wilmington, NC. Today, after touring Screen Gems Studios where the One Tree Hill series is shot, we got hungry from all that walking and went to Fajita Express just for a quick and cheap lunch. We had our doubts walking in because of name and the fact that it has drive through service, but what the heck, we were hungry. The usual fare like fajitas, tacos, burritos, enchiladas, were passable enough. Asi had fish tacos which were quite good, but the surprise for me was this huge bowl of steaming menudo! 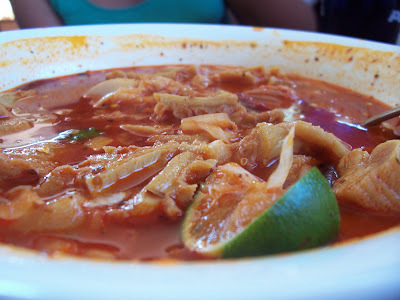 I have seen pitiful immitations of menudo, but this was the real thing. It was full of tender tripes and ligament floating in a spicy and savory soup. It came with a platefull of condiments: dried oregano, dried chile, chopped onions, cilantro, and lime. It would have been great with a huge glass of margarita, but as I was driving and sitting at a table full of kids, that wouldn’t have looked too well. This bowl was huge! I was so excited that I forgot to take a photo before I started eating. This photo was taken after I’ve had my fill and it was still over half full! As menudo takes a long time to cook, they only serve this on weekends. The best thing is the price. The huge bowl, with condiments and fresh, hot corn tortillas only cost $4.99. For dessert, they have a freezer at the front of the restaurant, in front of the bar, with some exotic, delicious popsicles. We each got one flavor of passion fruit, coconut, strawberry, and some blue stuff that The Clone chose, and they were all delicious! Now, I love dives with good food. My husband probably won’t go into this place, but if you like good, cheap food, this place is for you. Jade who is usually picky with where and what she eats was happy with this place and even liked their refried beans which tasted like it didn’t come out of a can. If you are ever in Wilmington, NC on a weekend and you’re into menudos, drop by this unassuming place. Why does my menudo spoil a day or two after cooking? I’m seriously thinking about experimenting at home. I just hope my family does not disown me for cooking tripe in winter when we can’t open up the windows. LOL! hi chase! I didn’t even know they canned menudo. haha! Hi rebecca, odor is my first criteria. Nothing can spoil a good offal dish more than a strong, unpleasant smell. That is one reason I don’t usually eat dishes with offal. If I can smell it, I’m not touch it 🙂 These, even though they came steaming to the table, did not give off any unpleasant odors. That means whoever cooked it knew how to clean it, prepare it, and season it. Man, I’m wishing I could have some more now. your menudo appears much more appealing than the bowl i had a while ago at my local mexican tacqueria. it’s bad odor put me off tripe for good. and i used to love getting the tacos de tripe.